Last week we were alerted to an article published in the Star Weekly regarding the plight of Seymour Cottage, a significant 19th century gold rush-era cottage in Romsey, that has fallen into disrepair and requires significant restoration. According to the article, Seymour Cottage has sustained extensive termite damage that could lead to potential structural failures and is closed to the public due to safety concerns. The building was entrusted to the Romsey and Lancefield Districts Historical Society in the 1980s and they have launched a financial appeal to preserve it for future generations. The cottage, formerly known as Barton Cottage, was built between 1856 and 1868 in the town of Romsey, north of Melbourne, by Sidney Seymour and his wife Elizabeth. 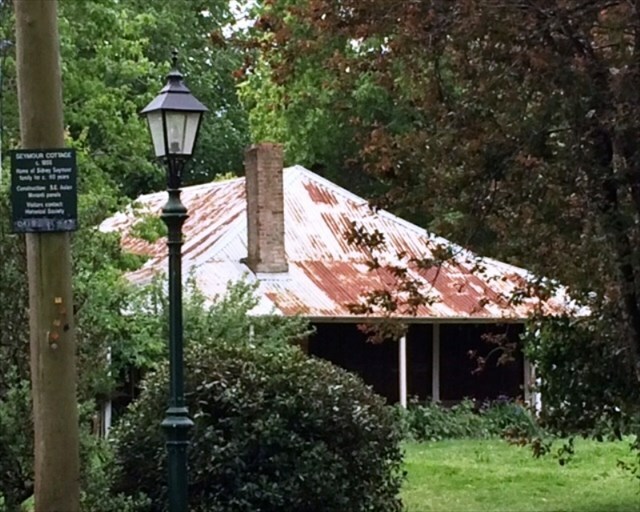 Seymour Cottage is included on the Victorian Heritage Register (File no: H2268) and also covered by a Heritage Overlay within the Macedon Ranges Shire (HO194.) 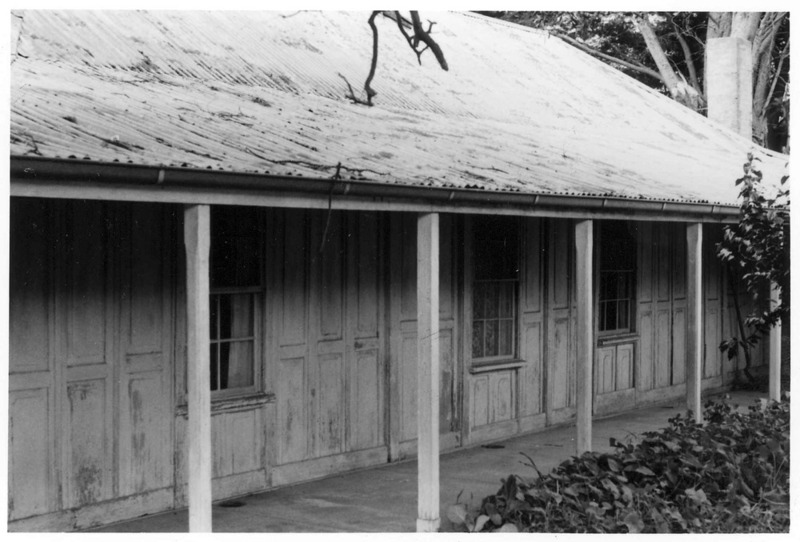 On a state level, it is considered significant for its unusual use of prefabricated ‘meranti’ doors from Singapore as external walls and as an example of the “proliferation of prefabricated buildings and materials imported to meet the demand for accommodation in the rapidly expanding colony of gold rush era Victoria”. On a local level, it is also considered significant as one of oldest buildings in the area and due its association with the Seymour family, whose activities are closely linked with the history of the Romsey and Lancefield districts. Seymour Cottage, Romsey was built in the 19th century in the gold rush-era and is one of the oldest remaining structures in the area. 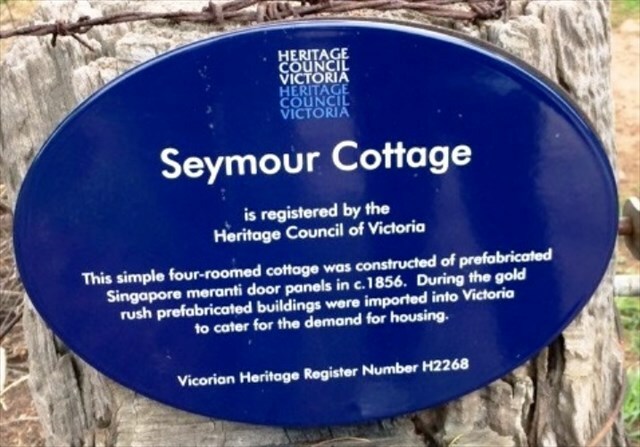 Seymour Cottage, Romsey is included on the Victorian Heritage Register. To find out how to help Seymour Cottage, contact the society’s secretary Shirley Kishere on 0402 248 540. According to the public records office the block was vacant land in 1915 when it was sold. Sidney Seymour didnt purchase any land in Romsey until 1885. While the cottage is important it has not been fully researched and was only heritage listed on local heresay. I have been researching this cottage for 8 years search for the page on facebook Seymour Cottage Research Project.